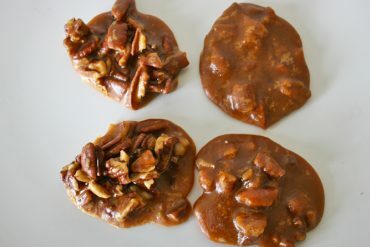 Pecans are a favorite of mine and I love them in Bourbon Pralines. I do not know why but I only make a batch around the holidays. Probably, because there are more people around to eat them otherwise I would stuff my face. You would think candy making is complicated but these are easy to make and do not take long at all. The key is to have your pans out, a glass of cold water, and a spoon handy. Get a good size pot out and hang a candy thermometer on the side. Measure out buttermilk (seems like an odd ingredient in candy I know! ), baking soda, salt and sugar, pour into the pot. Over a high heat, stir until it reaches (210F) and keep stirring for 5 minutes. Try to hold it at 210F as much as possible. I sometimes turn the burner heat up and down trying to maintain the temp. 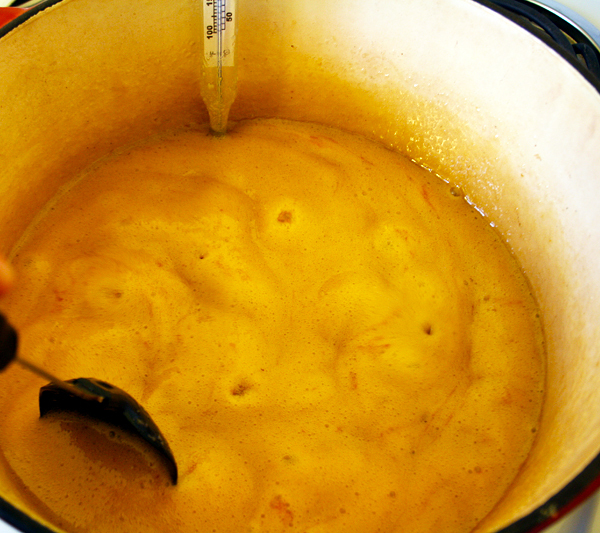 It will start turning a light caramel color. 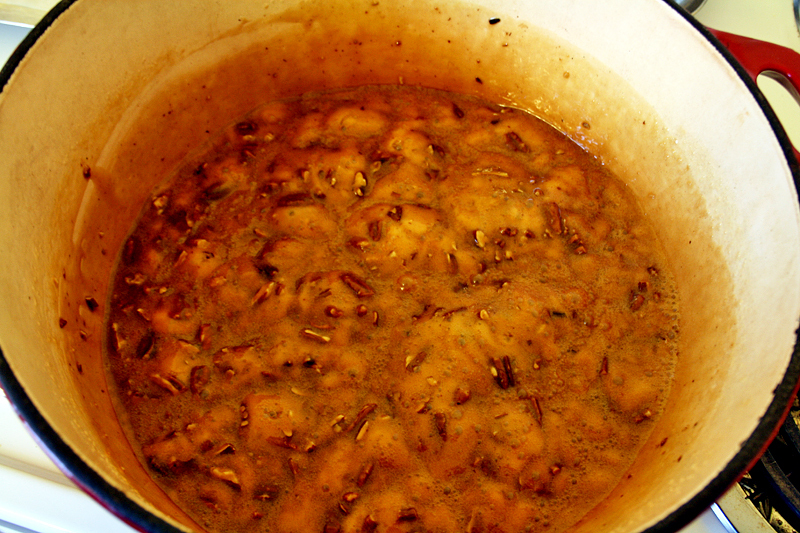 Stir in the butter and pecans. Test just a smidge by dropping a bit of it into the glass of cold water. It should ball right up when it is ready. Remove it from the heat and add the bourbon. If you have your head over the pot like I did the first time you will get a huge hit of bourbon aroma! Let it rest for just a minute then stir for 5 minutes or until it just starts to thicken. 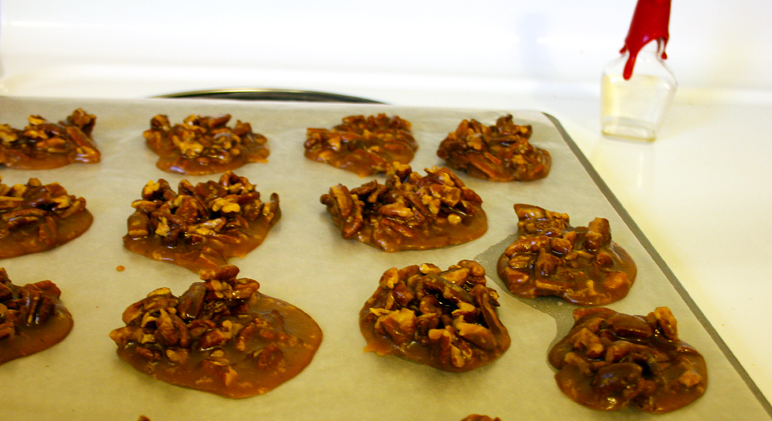 Drop by spoonfuls on parchment lined cookie sheets and let cool. 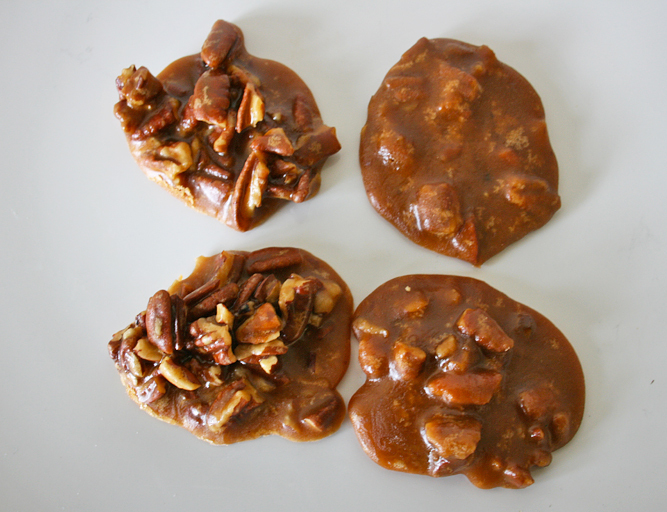 Here is a comparison of the first pralines dropped on to the cookie vs. the last ones. The ones on the right were the last out of the pot and were already cooling off. They will be a bit more solid when trying to drop on to the sheet and are cloudier but still just as tasty. Hang a candy thermometer on a large pot. Combine buttermilk, soda, sugar and salt in pot. Adjust thermometer, if needed, so tip touches liquid. Over high heat ,stir constantly and then for stir for 5 more minutes when temperature (210F) is reached. Keep stirring constantly until a little of the mixture poured in cold water forms a soft ball. Remove from heat, add the bourbon, stir it in and let sit for just a minute. Stir for 5 minutes or until it just starts to get thick. Drop by spoonfuls on to cookie sheets lined with parchment. Let cool and harden. « Next Post Lambs are Here!